Security requirements can be confusing. When CISOs defend the value of their security program, they often struggle to make their presentation easily accessible to the board of directors. Similarly, when choosing between security service providers, it can be difficult to decode the vendors’ promises in order to determine which one is the right choice for your enterprise. 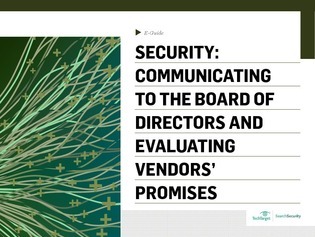 This informative e-guide provides expert advice on how to plan security assessment reports to effectively communicate key security elements to the board of directors. Inside, also discover how a vendor security checklist can help you weigh your security needs against vendors’ claims.